The Next MacBook: Mac OS X, iPhone OS X, or Both? "So I received the newest Final Cut Studio (not officially called '3' but it certainly is version 3) and I used the excellent and free FCS Remover from Digital Rebellion and uninstalled Final Cut Studio 2 from my trusty MacBook (which was able to handle editing a short, commercials, and a feature film in Final Cut Pro 6) last night in anticipation of installing FCS 3 today. "Excited, I put in the installation disk, only to get a warning that 128 MB of VRAM is needed and I only have 64 MB. BUMMER! And not only that, but the integrated Intel graphics processor also throws out my chances. Okay so I wasn't able to use Color 1.0 in FCS 2, but can't I at least install FCP 7 and the newest versions of Compressor (3.5) and DVD Studio Pro (4.2.2 - no Blu-ray authoring)? No luck...."
"There's a thread at Apple's Discussion Boards about an issue that's bothering a number of users. Specifically, the current model 17" MacBook Pros seem to be experiencing hard drive lag...."
Mac 360's Ron McElfresh says that the little white, $999 polycarbonate MacBook is looking awfully lonely and wonders if Apple has a new MacBook on the way that will run Mac OS X, the iPhone OS, or both. He acknowledges that most new Apple hardware rumors this year are pointing toward a tablet device but observes that Apple sells boatloads of white polycarbonate MacBook models to schools and wouldn't want to jeopardize that lucrative, bulk sales business with a revolutionary model that may not catch on. Link: The New MacBook: Mac OS X, iPhone OS X, or Both? "It was almost perfect, that is. What's missing has been a known issue with Mac laptop running Boot Camp: the battery life. According to Apple, the MacBook Pro offers about eight hours of battery life (in my experience it's more like about five hours, which is still very impressive). However, when running Windows XP and Vista, this reduces the life to just merely an hour and a half. And you guessed it: it's the same with Windows 7." And again, it's good to remember the "almost netbook" (sans net) that Apple made more than a decade ago, the Knowledge Navigator. Investor's Business Daily's Patrick Seitz predicts that low-cost mini-notebook "netbook" computers will be hot sales items for this year's back-to-school season based on some analysts' projections, although probably not as replacements for desktop PCs or full-size notebooks, but rather for tasks like note-taking in class, use at coffee shops and Internet hot spots and so forth. The article notes that netbook makers include all the major PC companies except Apple, which appears to have missed the boat for this year's back-to-school buying binge even if the most optimistic rumors are realized and they get a tablet computer out the door in September. ZD Net's Andrew Nusca says that when it comes to "dead-finger tech" (technology that's so integral to your life that you'd have to pry it from your cold, dead fingers), his choice is clear: the 13-inch Apple MacBook Pro. Nusca adds that for all of his computing life, he's switched between Macs and PCs and never felt any particular allegiance to either system, but this time as a replacement for his main rig, the new MacBook Pro model revealed itself to be a cut above the rest. "Can lower prices make Apple's ultra portable more appealing?" asks Macworld UK's Jason Snell, noting that the MacBook Air is a product that lives on the margins, being Apple's slowest laptop - indeed, slowest computer - bereft of many features that come standard on other Mac laptops such as multiple USB ports, a FireWire port, an ethernet port, and an internal optical drive. 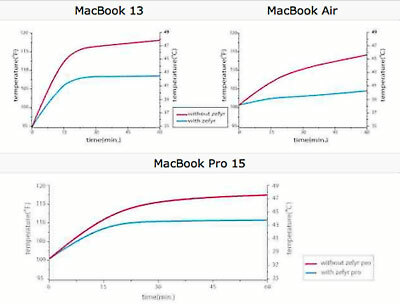 Further marginalizing the Air is that the top-of-the-line 2.13 GHz model actually benchmarked slower than its predecessor, the late-2008 1.86 GHz MacBook Air, in many of Macworld's tests, but Snell affirms that Macworld still loves it, and goes on to explain why, noting that at least the price has been cut substantially and Apple has finally started including a 10/100 USB-to-ethernet adaptor in the box. Snell also reports that the current low-end 1.86 GHz model did a better job versus its entry-level predecessor, besting it on most tests and improving on its Speedmark score. "A MacBook Air may connect to a Netboot or Netinstall server using an Apple USB Ethernet Adapter. "For Netboot or Netinstall client Macs other than MacBook Air, connect directly from the computer's Ethernet port to the Ethernet network." "The prospects of a premium priced Apple tablet computer may brighten at the hands of an unlikely ally, if Microsoft can carry out its stated goal of raising netbook prices using Windows 7." "Speaking at Microsoft's annual Financial Analyst Meeting in Redmond, Washington, chief executive Steve Ballmer told investors that Microsoft, Intel, and PC makers 'screwed up' by not delivering 'cool' low-price, lightweight, high-performance laptops. "Instead, he said, we have netbooks that do well on price, power, and 'cool' factor, but fail on 'super-small' screen and keyboard size. "Ballmer promised a range of ultra-thin laptops from PC makers in time for Christmas that customers who want a full-size screen and keyboard when shopping for a netbook." "Notebook players originally expected demand for ultra-thin notebooks to heat up in July and August of 2009, but the Windows 7 upgrade coupon promotion is stimulating limited demand while first-tier makers such as Hewlett-Packard (HP) and Dell will not enter the market until September. As a result consumers are still taking a wait and see attitude, according to industry sources." PR: CPU Speed Menu allows you to switch between the different performance settings of your computer by a single mouse click. It is no longer necessary to open System Preferences, navigating to the Energy Saver pane and selecting the Options item. This is helpful for users who must switch between different speed settings very often, for example when temporarily performing processor-intensive tasks. Switching manually to a speed which meets your current needs best can improve battery load on portable computers, or avoid noise problems with cooling fans and power supply units on desktop computers. CPU Speed Menu can be used on all Macintosh computers which support manual switching of processor performance. This includes all portable computers with PPC processors, as well as most G5 systems. CPU Speed Menu is electronically distributed software. You can download the product and test it before you decide to purchase an unrestricted usage license. Distribution of CPU Speed Menu will end on September 1, 2010. Technical support for registered customers will end on September 1, 2011, at the same time when Apple is likely expected to discontinue all hardware support for computers on which using this program makes sense. New in version 1.4: The application has been prepared for future operating system developments. PR: ThermoInDock displays graphs of temperatures obtained from the internal thermal sensors on your Mac in the Dock. ThermoInDock employs the module system to provide a great variety of appearances of graph of the CPU load in the Dock. To choose and configure a module, choose ThermoInDock > Preference... menu. On the preference panel, please choose a module you would like to use. If the selected module is configurable, click Configure... button to configure it. PR: Looking for that extra bit of screen real estate to get you through the busy workday? Referring to notes while writing an email, checking info in a spreadsheet while entering data into a web page, keeping an eye on your to-do list while browsing YouTube . . . it's handy to have additional monitor space at the ready. Problem is an entire secondary monitor comes with its own needs like requiring a separate power cord or perhaps an additional video card. The Mimo Mini USB Monitor changes this equation completely by offering a low-maintenance relationship between you and an extra display. A single USB connection from your computer gets you an instant high-resolution secondary display. This awesome display is perfect for your IM client, widgets, PC gaming tools, your email, a spreadsheet, your Photoshop tools, or even video! Not only do these displays enhance productivity, they look great! The single USB connection, combined with a weight of only 1.3 pounds, means the Mimo monitor is ultra portable and cost-effective, as no expensive extra video cards are required. 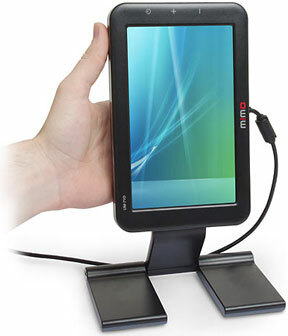 Small monitor runs completely off of USB, giving you an extra mini display whenever and wherever you need it. No extra power needed. The Mimo monitor is powered by USB. No extra video card. The Mimo has a built in video card that runs over any USB 2.0 connection. Rotating Portrait or Landscape view. Go vertical for notes and spreadsheets, horizontal to watch a movie. PR: The Logitech Unifying Receiver is a tiny wireless receiver that can stay plugged into your notebook's USB port and lets you easily connect up to six compatible wireless mice and keyboards to the same receiver. There's no need to unplug it when you move around, so you won't have to worry about losing it. With a Logitech Unifying Receiver you get wireless freedom and convenience without the hassle of multiple receivers. It's easy to add a compatible wireless mouse or keyboard to the same receiver. And your wireless devices are ready when you need them. We've got a range of products that you can connect to a single, tiny receiver you can leave plugged into your notebook. Create the combo that works for you. Notebook computers aren't just for road warriors anymore. See what makes the Unifying Receiver and compatible mice and keyboards the ideal wireless solution for your business. Make a wireless connection. Or two. Or six. Do you use - or would you like to use - a wireless mouse? A wireless keyboard? Both? Do you have multiple wireless receivers taking up USB ports? Do you need to unplug them every time you move around with your notebook? The Logitech Unifying Receiver and software makes it easy to connect up to six compatible wireless mice or keyboards to the same tiny receiver. There's no need to unplug it when you move around, so you won't have to worry about losing it. Logitech designed the Unifying Receiver to give notebook users an easy, convenient, clutter-free way to connect all of their compatible wireless mice and keyboards to their computer. Instead of juggling multiple receivers that can be lost, you can leave one Unifying Receiver plugged in. Your compatible wireless mice and keyboards are ready for instant use - wherever and whenever you need them. The Logitech Unifying Receiver comes with a variety of Logitech mice and keyboards, so go ahead and build your perfect combo. Keep a full-size mouse on your desk. Put a carry-around mouse in your briefcase. Hide a keyboard under the couch. With a Unifying Receiver you can set them up once, and they'll be ready whenever you need them. PR: A MacBook under continuous demanding usage will become uncomfortably warm and the noise generated by the internal fans will become disruptively loud. Without proper thermal management, your MacBook may overheat to a point where it runs much slower or even locks up. As a subtle yet effective cooling solution, Zefyr is designed to maintain your MacBook's system stability even under peak loading conditions. At the core of Zefyr's design is a high-thermal conduction interface compound, which enhances heat dissipation by providing a direct heat conduction path between MacBook's bottom casing and Zefyr's cast aluminum heat sink assembly. The thermal interface compound is soft and compressive to ensure decent contact while preventing abrasive scratches to your MacBook. Heat accumulated in the heat sink is then expelled through the sides by a high-efficiency USB-powered fan that runs near silent. Zefyr is designed to strike a delicate balance between form and functionality. It is extremely portable and does not require the use of additional power adaptors. This allows you to utilize Zefyr on the go without any hassle. When Zefyr is put in place, you also gain the benefit of improved ergonomics through a slight tilt to the MacBook. Overall, Zefyr is an unobtrusive thermal management solution that offers you a more comfortable computing experience. 100% cast aluminum heat sink assembly. Collapsible design for enhanced portability. Embedded USB-powered ultra-silent fan (<20db). 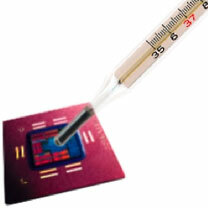 Conductive heat dissipation through compressive TIC cooling pad. Slightly elevated angle for better ergonomics. PR: In time for back-to-school shopping, Belkin brings a range of affordable laptop and iPod accessories designed with students' needs in mind. Students, as well as their parents, will appreciate these colorful and fashionable accessories that will not only protect their gadgets, but will help them survive the school year. According to the National Retail Federation, because laptops and computers are becoming more and more affordable, spending on electronics and computer equipment for back-to-school season is expected to increase 11%. This colorful mouse provides a stylish, comfortable shape that form-fit to any-size hand. Its USB dongle doubles as a perch to hold mouse in place when moving from room to room. 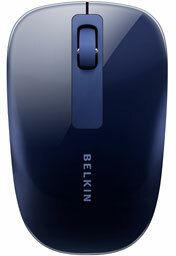 The Wireless Comfort Mouse is available in Pitch Black, Midnight Blue, Fuchsia, and Candy Red. This backpack provides a stylish and comfortable solution for students to carry their laptops to school and back. The padded, adjustable straps allow comfortable and convenient mobility Its material is easy to clean, making this backpack ideal for busy lifestyles. The Venice Backpack comes in Aubergine/Grape, Fuchsia/Very Berry, Pitch Black/Soft Gray, Candy Red/Jetset Red, and Midnight/Dark Sky. For students tired of sitting at their desks, the CushDesk offers comfort and convenience by allowing them to use their laptops anywhere - on the couch, bed, or floor. CushDesk also keeps students' laps cool and protected from a hot laptop, while providing a smooth and sturdy surface, or "workspace." Additionally, its slim design allows for easy storage in the living room or bedroom. CushDesk is available in Pitch Black/Soft Gray, Espresso/Fuchsia, Pitch Black/Pitch Black, and Pitch Black/Dark Sky. PR: The Atlona AT-DP200 is a DVI to Mini DisplayPort converter designed to convert every Mac or PC computer's DVI or mini-DVI signal to a digital signal over a Mini DisplayPort connector, which is currently used on the Apple 24'' Display. The AT-DP200 allows users to extend their desktop to an Apple 24'' (or similar DisplayPort display). 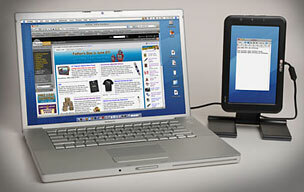 Users can use the connected monitor as their main display or extend their desktop using it in addition to their laptop's screen. 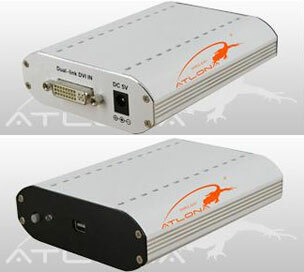 The Atlona DVI to Mini-Display Port Converter is compatible with all Apple and PC Computers which have a DVI or Mini-DVI connections. PR: According to a study by Consumer Reports, 43% of laptops and computers fail within the first three years of ownership. As if the stress of having your computer breakdown isn't enough, having to send it away for repair instantly places hundreds of thousands of parents, students and business owners into panic mode as Internet, e-mail and crucial web-based tools instantly disappear. ElectronicWarranty.com, a provider of high-quality warranty protection on electronics and appliances, has found a way to ease this stress with its unique new Laptop Loaner Program which gives customers a loaner laptop while their computer is serviced through the company. Providing consumers extended warranty protection solutions at prices up to 70% lower than retailers, ElectronicWarranty.com's new On-Loan service is available to all customers who purchase a laptop warranty through the company. Losing the use of your laptop is a major headache, says Geoff Green, president of Extended Warranty Group, the organization behind ElectronicWarranty.com. We've listened to our customers and understand the loss in productivity and inconvenience they experience when stranded without a computer for days at a time. Our goal with this program is to minimize the havoc this inconvenience creates for them. The concept behind the Laptop Loaner Program came about through conversations with customers who overwhelmingly reinforced the importance computers play in their lives. Gathering feedback and suggestions from small business owners, working professionals and active job-seekers, as well as parents and young college students whose curriculum requires ongoing computer usage, ElectronicWarranty.com crafted this program to alleviate the painful stress and other problematic issues surrounding an inevitable computer breakdown. ElectronicWarranty.com offers savings of up to 70% for people looking for reliable options in extending the life of their valuable electronics and appliances. With free price quotes available instantly online, the service provides more coverage for electronic and appliance purchases than traditional in-store plans. The comprehensive coverage includes: mechanical, electrical and surge protection failure, 100% parts and labor, quality-checked service technicians, and in-home service for larger items. Green adds that by buying directly through ElectronicWarranty.com, consumers eliminate the retail middleman and avoid high mark-ups that keep them from purchasing a reliable warranty to protect what they've just made a substantial financial investment in. Consumers with an existing warranty or those interested in purchasing a warranty through ElectronicWarranty.com to take advantage of the Laptop Loaner program can visit electronicwarranty.com or call 1-866-943-4724 for details on how to sign-up. 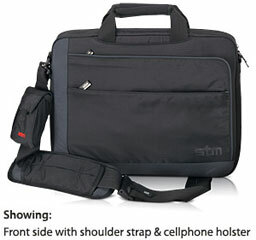 PR: The Remedy Laptop Shoulder Bag is a minimalist messenger bag with finely detailed features. Two models are available specifically designed to accommodate Apple's MacBook, MacBook Pro and PowerBook notebook lines. The Remedy features a snug-fitting notebook section with high-density padding and an organizer pocket on the front for all your essentials. A comfortable handle allows the Remedy to be carried as a briefcase and attaching the removable strap converts it into a shoulder bag. The Remedy features a generously padded notebook cell, pockets for cables and adaptors, a slim pocket for documents and a detachable cell phone caddy. 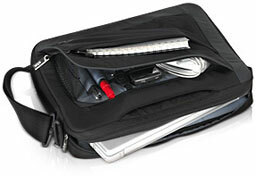 Favoring style somewhat over space, the Remedy provides a tailored fit for Apple 'Books and many PC notebooks as well. MacMall launches a new, faster website with improved search capability, enhanced product information, and faster checkout. MacMall is offering prices lower than Apple's College Student Discount to everyone to celebrate. "To better serve our customers, we sought out customer feedback on what was important to them in their online and telephonic shopping experience, and we invested our time and effort to deliver an improved customer experience. In addition to the launch of our enhanced website, we are announcing a Back-To-School sale for everyone with better prices on the MacBook, MacBook Pro, MacBook Air and iMac than Apple's highly publicized discount offers for college students," said Dan DeVries, Executive Vice President of PC Mall, Inc. "Additionally any college student that purchases one of these Apple computers from us can get an Olympus 10 megapixel camera for free after mail-in rebate." View Mac accessories, iPod accessories, software, storage, HDTVs and other consumer electronics on MacMall's Back-To-School Sale.